Join us on a truly epic cycling adventure through this mysterious and relatively unexplored cycling territory as we permeate further Eastwards through Europe. Riding through three more exciting countries on this stage from Thessaloniki on the Aegean Sea to Istanbul at the frontier between Europe and Asia, from one great city of the Mediterranean to another we weave a path through the ancient lands of Greece, Bulgaria and Turkey steeped in history and legends. At the end of the ride. 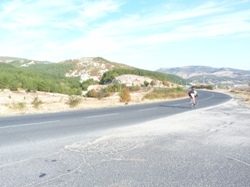 Some of the team will have completed an epic Odyssey all the way from London to Istanbul. The ride will take in firstly the Aegean Coast of greece, before we take an unexpected turn inland once again to allow us a sneeky view of Bulgaria. Crossing a recently opened border crossing used by few, we shall enter Bulgaria by the back door, and enjoy an exploration of some of the country's quieter corners. Finally we shall make our crossing into Turkey, and will be witness to an amazing transition in culture between Eastern Europe and the middle east. This is a ride in the true meaning of adventure and accommodation will be a mixture of simple hotels & B&B's throughout the event (including buffet breakfasts). The standard of accommodation will fluctuate throughout the trip - but is designed to be functional - and to enable us to get a good night's sleep - and continue with the challenge. You will be sharing in twins or triples. If you require a single room then please request this at time of booking (a small supplement will be payable). Upgrades may be available for an extra charge if required. 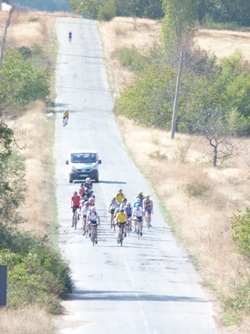 This trip includes one night in Thessaloniki prior to the ride, and the night at the end of the ride in Istanbul. You should hold a valid passport for this event - Please check your passport validity! If you are unsure if your passport is valid to travel through the countries stated in this challenge please contact the Home Office for advice. Collection from Thessaloniki Airport, 7 nights accommodation (B&B), cycling leader/mechanic, first aider, team tools and spares, support vehicle & driver. One transfer vehicle for the airport will be included. Please ask Adventure Café before booking flights. Lunches and Dinners, International Flights, Spare Parts used. We hope to experience some pleasant Mediterranean warm weather - although, as ever, be prepared for all kinds! Typical weather stats for Thessaloniki / Istanbul in September/October suggest average daily maxima of between 22 and 25 degrees.